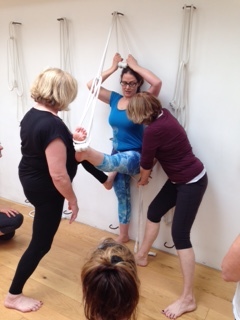 Workshop at The Iyengar Yoga Studio, East Finchley. Uttitha Hasta Padangustasana 1 on The Ropes. We help her roll her outer thigh down while moving her standing leg thigh back to the wall. She presses her standing leg foot down, and raises her spine and chest. 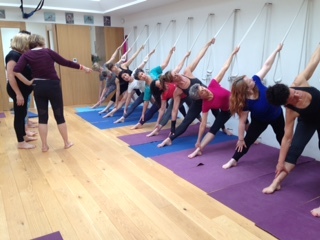 Uttitha Trikonasana on the ropes. Anchoring your back foot to the wall, and holding the rope will help give you the momentum needed to extend your torso away from the wall. 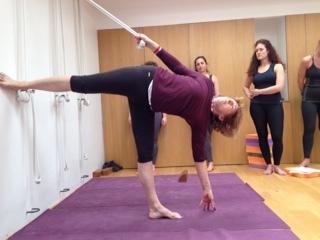 Ardha Chandrasana on the ropes. Turn your head back, move your dorsal spine and tailbone forward. 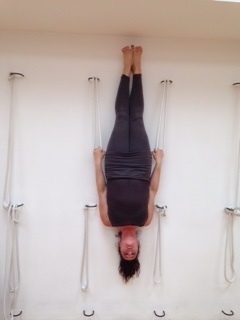 Rope Sirsasana. Secure the upper arm bones into the sockets — overlap the triceps onto the deltoids, and the deltoids onto the shoulder-blades. Rope Urdhva Mukha Svanasana. Similarly, maintain the connection of your upper arms and shoulders. 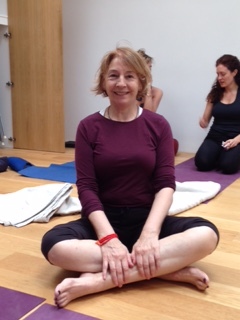 Viparita Dandasana. Firm your shoulder-blades onto your upper back ribs. Walk your hands along the belt toward the wall.